The shape of this flag, like the Ohio flag, is called burgee. 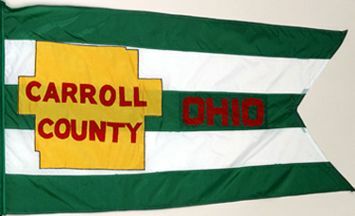 The Carroll County flag has 3 green stripes and 2 white stripes. It also features a yellow map of the county. The name of the county reminds us of Charles Carroll, the last surviving signer of the Declaration of Independence.